Step 3: Paste the following code right underneath and change the text to your own information. Replace @howlmeflash with your blog twitter username. If you and blog twitter username is different replace @howlmeflash with your use name if not then add you username in it. 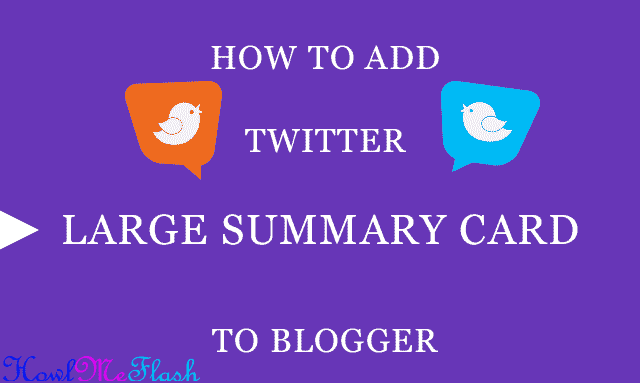 Make sure that you have successfully installed Twitter Cards code on your blog. Run your URL against the validator tool to test. After testing in the validator see the Card appear below your tweet in the details view. In first time implementing Twitter Summary Card with Large Image , image in twitter cards simply failed to load. Seemed that the image being pulled from data:blog.postImageThumbnailUrl in the Validator was coming up very small (72x72px) thus probably why the summary_large_image card wouldn't render it since the minimum required is over 280px wide. So we solve by replacing data:blog.postImageThumbnailUrl to data:post.firstImageUrl which simply worked like a charm.